On the first day, all we really encountered was the great Ghost Pine of the California Chaparral. We’d never hiked the High Peaks trail before, and we didn’t know what to expect. We encountered a strenuous hike with a 1600ft climb. The reward was worth it. At the top we entered a nice meadow with views of rolling mountains for miles and miles. Steph dropped Jolene from her backpack and let her run. Chas found his usual distant sitting spot to take in the view, and I orbited the family to capture the moment. On Chas’ spot: He found a nice location just beyond a grand grey pine which overlooked the Southern portion of the park. He didn’t know it, but the valley he was absorbing was the uppermost peaks of the Bear Creek caves he loved to explore. I’ve a great photo of him taking in the view that I will post later. Still, what was striking about his position at this moment was the tree under which he parked his tired self. Trees 12-21(25) m with diameters of 60-120 cm, straight to crooked, often forked; crown conic to raggedly lobed, sparse. Bark dark brown to near black, irregularly and deeply furrowed, ridges irregularly rectangular or blocky, scaly, often breaking away, bases of furrows and underbark orangish. Branches often ascending; cone-bearing branchlets stout, twigs comparatively slender, both pale purple-brown and glaucous, aging gray, rough. Buds ovoid, red-brown, ca. 1cm, resinous; scale margins white-fringed. Leaves mostly 3 per fascicle, drooping, persisting 3-4 years, 15-32 cm × 1.5 mm, slightly twisted, dull blue-green, all surfaces with pale, narrow stomatal lines, margins serrulate, apex short-acuminate; sheath to 2.4 cm, base persistent. Staminate cones ellipsoid, 10-15 mm, yellow. Ovulate cones maturing in 2 years, shedding seeds soon thereafter, persisting to 7 years, pendent, massive, heavy, nearly symmetric, ovoid before opening, broadly to narrowly ovoid or ovoid-cylindric when open, 15-25 cm, dull brown, resinous, stalks to 5cm. Scales long, thick, sharply keeled and 4-sided; apophyses elongate, curved, continuous with umbos to form long, upcurved claws to 2 cm. Seeds narrowly obovoid, thick-walled; body ca. 20 mm (largest in the genus), dark brown; wing broad, short, ca. 10 mm, shed easily. 2n=24 (Little 1980, Kral 1993). 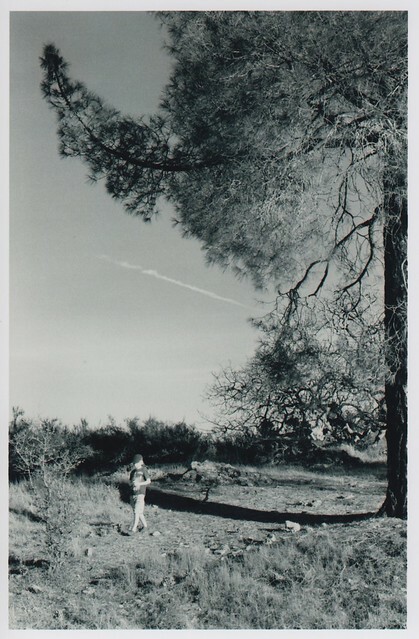 This day has been as hot and dusty as the first, leading over gently sloping brown hills, with mostly the same vegetation, excepting the strange-looking Sabine pine (Pinus Sabiniana), which here forms small groves or is scattered among the blue oaks. The trunk divides at a height of fifteen or twenty feet into two or more stems, outleaning or nearly upright, with many straggling branches and long gray needles, casting but little shade. In general appearance this tree looks more like a palm than a pine. The cones are about six or seven inches long, about five in diameter, very heavy, and last long after they fall, so that the ground beneath the trees is covered with them. They make fine resiny, light-giving camp-fires, next to ears of Indian corn the most beautiful fuel I’ve ever seen. The nuts, the Don tells me, are gathered in large quantities by the Digger Indians for food. They are about as large and hard-shelled as hazelnuts, –food and fire fit for the gods from the same fruit. And here’s Chas, exiting the shadow influence of a great Ghost Pine, Pinus sabiniana, on the High Peaks trail in Pinnacles National Park, CA. This entry was posted in Pinnacles by Damon. Bookmark the permalink.